RGCG is proud to offer the Certified Agile Leader certification as part of our agile coaching & training services. It is THE differentiator for successful agile transformations. Level 1 (CAL-1) certification with the Scrum Alliance. We frequently run private CAL-1 classes for organizational leadership teams, with great results, Please reach out to us for more information on this format and for a quote. Delivering a virtual CAL-1 class for an organization (private) in a variety of schedule formats. Partnering with a local agile group or consulting individual/firm to bring a CAL to your city. We endeavor to pair-teach each CAL class if at all possible. So, we're always looking for partners to pair-teach with us. We are also working on defining our CAL-2 delivery format and strategy, which will be released in 2019. IF you're a CAL-1 certified and want to continue your leadership journey, reach out to us for progress updated on this exciting "next step" for our CAL students. In 2015-2016 the Scrum Alliance began development of a new certification targeted directly to leaders who are tasked with creating and/or operating in agile software development environments. While the focus is clearly on Scrum, the larger focus is on generic leadership skills in all agile contexts. In 2016, the learning objectives for the certification were finalized and the first educators were approved. As of early 2019, there are ~ 40 approved, world-wide educators for the Certified Agile Leadership (CAL-1) certification. Each one of the instructors has developed their own unique course materials and class focus that supports the CAL learning objectives. Point being - the educator's real world agile experience and leadership experience matters a great deal and each class is uniquely valuable. We're proud to announce that Bob Galen was approved to deliver the CAL class in January 2017. Our primary driver for supporting and teaching the CAL certification is our fundamental belief that "leadership" is the next big thing when it comes to success in agile transformations. If you study the VersionOne State of Agile surveys for the last 10 years, you'll see a trend that the teams aren't the key challenges standing between organization's transitioning to agile approaches. It's the management-tier that is the ongoing challenge. And the survey clearly shows that we've not spent enough time assisting our leaders in making the shift. Well the CAL changes that. We're incredibly enthusiastic about the addition of the CAL to our coaching practice. We've been coaching leaders for the past decade. But the CAL gives us a much more holistic package of strategies & tactics to focus on. The certification also helps to gather attention to the seriousness of leadership training with respect to agility. The point being - CAL is a wonderful vehicle for Growing the next generation of Agile Leaders. Many of the Scrum Alliance CSTs and CECs have far too limited real world leadership experience. While they've studied leadership academically and try to empathize with the challenges, in a word, they really can't. They lack the seasoning and experience to truly understand agile leadership development. Bob has been leading software teams for over 25 years and agile teams for nearly that long. Bob has had roles in software development, software testing, architecture, operations, and project management. Bob has had senior level leadership roles at the Director, VP, and C-level in a variety of organizations. Bob has worked in small, start-up companies to large, enterprise level companies. So, he viscerally understands the challenges of scale. Bob has worked with distributed teams for over 15 years - both nearshore and offshore models from a wide variety of cultures. Bob has an incredible understanding of, respect for, and empathy for the craft of leadership. And all of this experience is weaved into the materials of our CAL-1 class - the stories, examples, breakouts, and the focus. The class provided great grounding on the role of leadership in an agile organization. Bob's experience in the technology industry brought real world examples and wisdom to the lively discussions that this course encourages. I highly recommend that you bring your entire leadership team along to this course. Bob led us through an exercise to create a set of elevator pitches on why we are doing Agile, explaining the why to our teams, our wider organization, and our customers. Bob taught us how to be a driving force for the critical conversations needed to coach our team members through change and help mold our scrum teams into the high performance teams we need to be competitive. 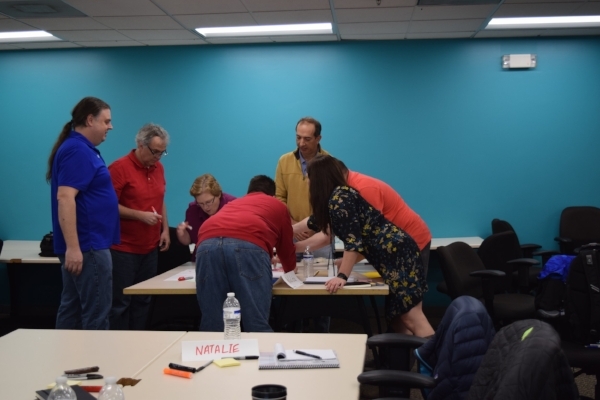 Overall, it was a great course and would help any organization that is looking to take their Agile Leadership to the next level. Highly recommend it. Bob has a wealth of knowledge and experience. He challenges you to think about how you are doing things, and then gently but firmly guides you to consider other proven approaches to Agile Leadership. He is a great coach for Agile Leaders. Had a great learning and coaching experience, and met some amazing people at the CAL-I certification workshop facilitated by Bob Galen in Dallas last week. I highly recommend this workshop for every Agile leadership team, especially middle managers whose role and importance is often overlooked in Agile transformations. You will learn about what imperatives you need to adopt in order to transition from an Agile adopter to an Agile catalyst in your organization. The class was outstanding. Greatly exceeded my expectations. Learned a lot. My thoughts on effective leadership have fundamentally changed. Very happy to add this knowledge to my toolkit. Taught by one of the best! The diversity of the audience, the role play exercises, the tools shared and the facilitator was awesome. The most valuable aspects were the coaching dojos and journaling through the sessions. Bob Galen is an amazing facilitator and coach. Enjoyed the interactions with attendees throughout and being able to learn from their experiences and also share mine. Also the breadth of information was good, covered a wide swath of topics pertinent to leaders. Liked the personal map a lot, and facilitating a discussion. Also liked the ahas. Leading agile teams might be one of the hardest things you’ve ever done. That is if you want to do it effectively and congruently. The agile methods have moved beyond hype and novelty to embed themselves in nearly every software company in the world. That’s sort of the good news. That these methods are here to stay and have the potential to be a game changer. The bad news is that it takes a leadership transformation to effectively make agility work. You see, you can’t just “go Agile” and not change your leadership style, habits, approaches, and posture. It also requires a culture shift. All of which point to you as a key guide to lead your teams through all of these changes. But there has been a lack of focus on leaders and the requisite leadership skills in agile contexts. Well, the good news is that this course is intended to address exactly that challenge. And do it in a practical way. Sharing stories, practices, and real world experience in into the dynamics of effective agile leadership. If you are looking to become a skilled agile leader, then this class is a wonderful way to kick-off that journey. What is the agile mindset, how to adopt it, and how to inspire it? A walk thru Bill Joiner’s - Leadership Agility. A quick overview of Scrum, XP, and Kanban thru the lens of the leader. The importance of trust in any agile transformation: downward, upward, and outward trust. The evolution of agility from a management and technology perspective – why agile? We’ll spend ~20% of the workshop focused towards developing your coaching skills; practicing coaching conversations throughout. How to become a better storyteller as a leader and the impact that narrative can have in agile contexts. How to create agile supportive organizational structures. The dynamics of agile at-scale exploring: models, frameworks, networks, and simplicity. What does high-performance agility “look like”? Effective agile metrics – what, how, and from where. How to approach “governance” within agile contexts. Approaches for strategically guiding organizational change; including agile transformation. Effectively structuring and leading distributed teams. We will also be leveraging the Leadership Circle Profile in our CAL 2 offerings during the latter half of 2019. Leveraging it in public and private cohorts. Depending on the cohort, we will be reviewing group and/or individual profiles. The class is a 2 ½ days in length. We’ve structured it that way to thoroughly cover the 17 contact hours required for the CAL certification. Classes will run from 9am – 5pm each day, with a full hour for lunch. On the third day, class will end at 12noon. The other reason for 2 1/2 days vs. 2 days is allowing for more think time between class days and to allow for a more casual immersion in the subject matter. There are about 3 hours of class prerequisites that will be emailed to you 2-3 weeks before the start of the class. There will also be the opportunity for two post-class follow-up sessions. One will be a Q&A session related to any class items that we weren’t able to cover to your understanding. The other will be a 1:1 coaching session related to your ongoing agile leadership journey. Both are “optional” and not directly related to certification. we’re trying to provide a springboard for your ongoing Agile Leadership - Learning & Growth Journey. The CAL is focused towards anyone in an organization in a management or leadership role. Line managers and up will gain value from the class. As would seasoned ScrumMasters and agile coaches. In addition, senior product managers or product owners would also gain significant value. But the sweet spot for the class is a company’s entire cross-functional leadership team engaged in an agile transformation. The broader the representation, the better. Regular pricing is $2,500 per attendee. For private classes, there are organizational / team level discounts available. Minimal class size is 12 for private classes; while our preferred class size is 12-24 attendees. Reach out to us to discuss your group needs and discount levels. We feel there is tremendous advantage to sending your entire leadership team to the CAL and will do whatever we can to make the costs approachable. For public classes, there are also group discounts (for 3-5 individuals from the same company) available. We usually offer an Early Bird discount for public classes as well. And finally, if you’re experiencing a hardship (unemployed, underemployed, contractor - self paid, etc.) but really want to attend, please reach out to us. We usually reserve several heavily discounted seats in each public class for folks who need a bit of help. Bob Galen has held senior leadership (C-level, VP, Director) roles within software development organizations since the early 1990’s. He has led small and large teams (+200) focused on software development, product/project management, testing, and operations. Always a student of leadership, he’s been on the forefront as management and leadership techniques have moved towards “the team”. An early adopter of agile methods, Bob has had in-the-trenches experience in building three successful agile technical organizations that have served as models of “agile done right”. Bob has broad and deep experience leveraging Extreme Programming, Scrum, and Kanban, having been a practitioner since the late 1990’s. In 2013, Bob became one of ~90 CEC level coaches with the Scrum Alliance. He coaches cross-organizationally around the world in helping clients achieve improved performance. Often called a “Coach of Agile Coaches”, Bob has included his deep and pragmatic experience in this class. Point being, you’ll learn from someone who’s been there, and done that, with respect to agile leadership and the challenges.